When David Thomson divorced in 1995, he was ordered to pay alimony to his ex-wife. The monthly payment of $2,500 was made via wage garnishments of $1,250 on the 15th and 30th of every month. The payments were to cease upon Thomson’s retirement, according to court documents. Over 15 years, Thomson’s paycheck was garnished and the payments were made – $450,000 in all. He was released from the payments when he retired in 2010. But now, eight years later, the Morris County Probation Service says it just discovered he missed a payment, making his account delinquent. Probation said there was no record of the final payment of $1,250 due Nov. 30, 2010. “They are insisting I must pay again, and are threatening me with court action, payment of outstanding interest on the money since 2010, and a lien,” Thomson said. 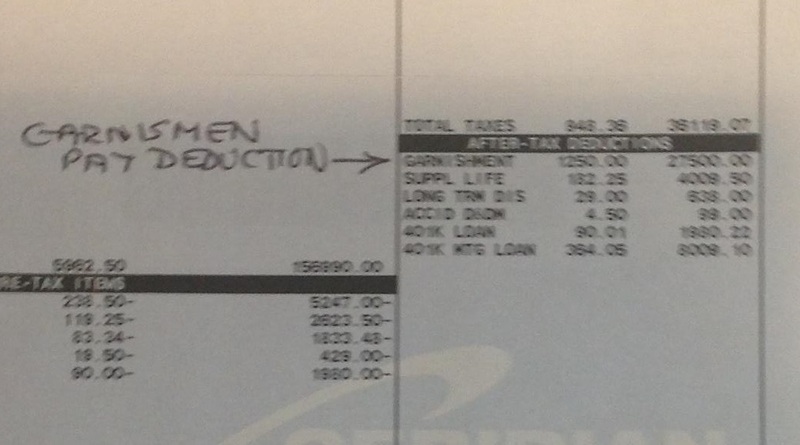 A cropped portion of the Nov. 30, 2010 pay stub that shows $1,250 was garnished from David Thomson’s check. At first, Thomson said, he wasn’t worried. He had proof he made the payment: a copy of his old pay stub from the date in question, and it clearly shows the money was taken out for the garnishment. Plus, he said, he never heard from his former spouse. “I’m sure if she didn’t get it I would have heard about it,” he said. He went to the probation office to offer the evidence. The employee offered to take a check, Thomson said. Thomson said he tried a different Probation employee, but those conversations didn’t go anywhere, either. The employee said he could contact his company to get an explanation about what happened to the money, suggesting the money may never have been transferred to Probation. But Thomson’s employer went out of business in 2015 and he said there was no one he could contact for help. The Probation employee then said it was possible the employer returned the money to Thomson, intimating that Thomson could have known about it. That never happened, Thomson said. Thomson contends it is not his fault that Probation’s records are somehow incomplete or missing information. “I surely cannot be held responsible for the misplacement or misappropriation of the alimony payment after it was taken from me at source, at the direction of my former spouse by way of the Morris County Probation Service, and that if it was thereafter misappropriated or misplaced, either by my former employer, or in the payment process in Trenton, or by the Morris County Probation Service – that can hardly be my fault or responsibility,” Thomson wrote in an email to Bamboozled. Thomson turned next to the court’s ombudsman for help. Thomson said the ombudsman told him this kind of thing has happened before in Morris County and he had two choices. He could get his ex-wife to agree to an order releasing him from the payment, or he could file a motion for the judge to set aside the order requiring Thomson to pay. So Thomson paid $50 and filed the motion. He awaits a July 6 court date. We reviewed the letter from Probation, the court order ending the alimony payments in 2010 and the very important pay stub. Indeed, it shows $1,250 was garnished on Nov. 30, 2010. We reached out to the court, which the probation department is under, sharing the evidence to see if it could free Thomson of the payment. A few days later, Thomson got a call from Probation. It was one of the employees Thomson had spoken to previously, and it wasn’t encouraging, he said. “She denied that she, or any of her colleagues, had ever told me I would have to still pay the lost alimony payment again irrespective of the evidence of my pay stub,” he said. But the employee also said that without a new order or acknowledgment from Thomson’s ex-wife, the missing payment would remain on his record, Thomson said. Thomson said he asked if that meant 10 years in the future, he could receive another letter. Yes, he said he was told. The employee said she would talk to her boss to see if anything could be done, Thomson said, but he never heard back. He’s planning to be in court on July 6. “I would not be surprised if I am not the only person they may be attempting to extort a double alimony payment from in order to cover up their misplacement or misappropriation of funds received,” Thomson said. We reached back to the court. For now, Thomson can do nothing but wait for his day in court. We’ll let you know what happens. Let this story be a lesson to anyone subject to court-ordered payments, whether it’s alimony or child support or any other kind of payment: Keep records. Hold on to proof. You never know if years in the future, the court will come calling.